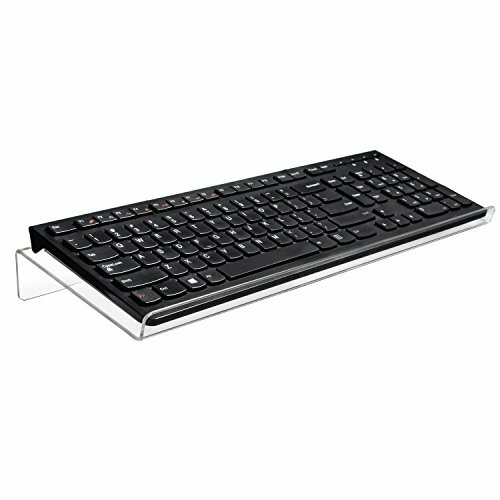 - Product Size:Approximate(W*H*D) 17" x 1-1/2″" x 5.5"
UNIVERSAL - The ergonomic keyboard holder fits most standard keyboards including big key keyboards;Dimensions: 17"W x 1-1/2"H x 5.5"D.
FUNCTION - The ergonomic keyboard stand can eliminate tension from the wrists,forearms and elbows due to long working hours in front of the computer and protect your body from unnecessary neck and shoulder issues that can seriously affect your health and productivity; As well as improving typing and help reducing painful mistakes. FINE WORKMANPSHIP - The angled keyboard stand is made of durable clear acrylic material; Smooth rounded edges and polished finish, every details make it outstanding and look great anywhere. STABLE - The keyboard holder with humanized design for a seamless fit, will keep keyboards stable, you will not worry the issue of "sliding" any more. ENJOYING YOUR WORKDAY - Whether you're working from home, school or at an office,This computer keyboard stand will optimize your workday, artfully designed for any decor. If you have any questions about this product by HBlife, contact us by completing and submitting the form below. If you are looking for a specif part number, please include it with your message.